Blog Quick Quotes: Want more Petaloo projects??? We had tons of great feedback from you all saying how much you loved the projects when QQ teamed up with Petaloo flowers a few weeks back. Here are 2 more amazing projects incorporating these awesome embellisments. RHONDA - "Time Stands Still For No One"
Greetings to you from Rhonda! 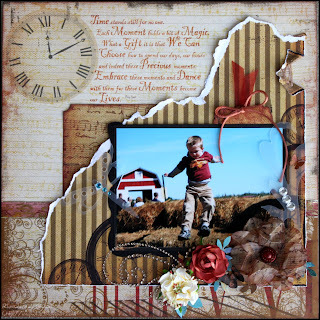 I am so excited to share with you a creation using our latest new line “Copper Kettle” from the November Club Q Kit! The line is so elegant with beautiful rich tones perfect for fall and transitioning into the holidays. I took this fun photo of our son during a break at the apple orchard. There’s something so carefree and nostalgic about the look of it with the barn in the backdrop. When I saw the quote on this page, I felt it suited this moment to perfection! Time stands still for no one. My little boy is not so “little” and every one of these moments is truly a gift! I decided to frame the quote out by tearing my other paper layers to compliment the shape and draw attention to it. A bit of distressing on that layer helped the feel as well. You’ll notice a partial frame under my photo in black. One of the black cardstock laser cut frames from the kit was used and trimmed to fit. The kit also contains an elegant acetate overlay with swirls on it. I’ve used a bit of that to soften the roman numerals on the bottom of the page with a bit of ribbon to help disguise the transition line. Of course some more of those beautiful Petaloo flowers coordinated perfectly with the vellum flower from the kit too. I used my Copic marker to deepen the color of the brad a bit. Don’t be afraid to get a little scrunchy with your vellum flower pieces, I thought it added some fun charm to the look of them. I inked the pieces after crinkling them up a bit. Hope you’re all doing well and ready to get your crafty mojo a shot in the arm! 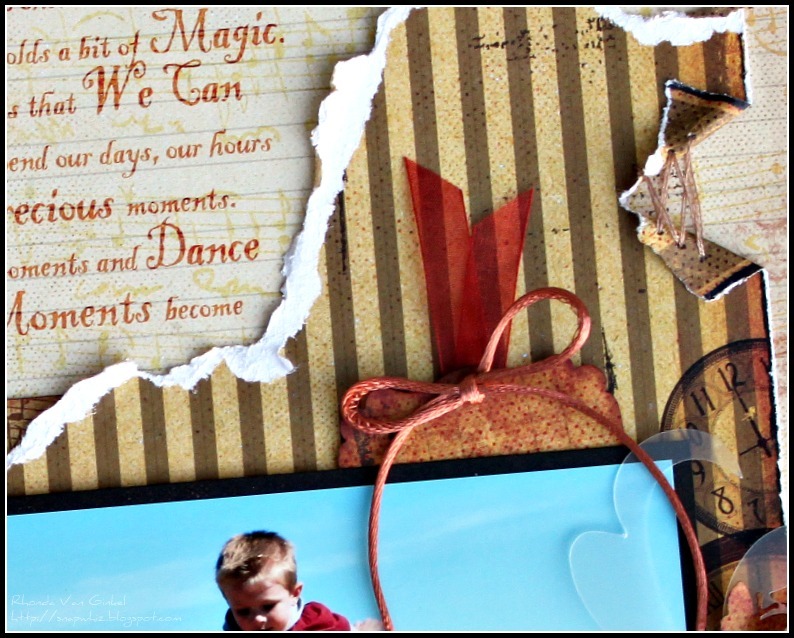 Today I am showcasing a project I made with the fabulous Club Q Kits from Quick Quotes! For those of you who don’t know, every month Quick Quotes produces some wonderful kits! 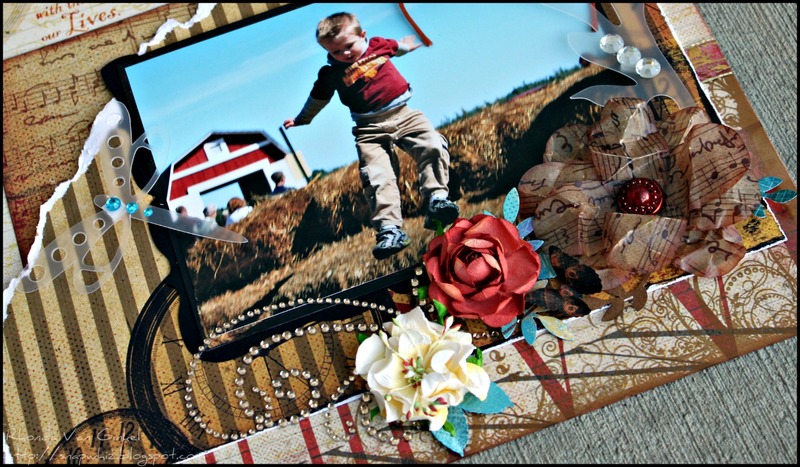 There are kits for mini albums, canvas and altered art projects and of course page kits to help preserve those memories. Here is the project I created. I used the add on kit of the shadow box above. I created this shadow box using the canvas from the kit and the black frame provided. Here is an angled shot to show the depth. Here is an additional angled shot. Close up shot of the butterfly. The additional supplies I used to complete this project were very minimal. Midnight Confessions, Blue Hawaiian, Amaretto, Mocha Mama, Powder Puff Chalk Inks. Are you participating in the latest QQ challenge? It's not too late. Click here for details! Great layout Rhonda, I love the paper tearing technique and the added petaloo flowers are perfect. What a precious gift Melin! !It's beautiful!